Rigid single-piece construction. Made of smoothly polished heavy-gauge stainless steel. Rigid single-piece construction. Made of smoothly polished heavy-gauge stainless steel. Commercial grade. Tough to bend. Hard to find. 24 inches long. 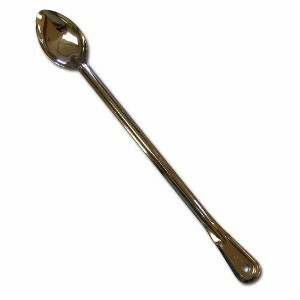 This 24" Stainless Steel Spoon is perfect for stirring the mash or wort in your brews. It is strong enough to mix up your mash to prevent those dreaded dough balls. Great for for boiling, brewing and mixing.